Each and every October/Novemberish after the time change, I feel winter set in with its cloak of darkness. It happens so fast and it catches me off guard every. single. time. It’s only 4:30pm, how can it feel like midnight?! I spend days, even weeks wishing it were spring. I feel the need to ditch this premature middle-of-the-night feeling and enjoy the bike-riding-til-8:00pm feeling instead. I have a lot of trouble accepting the season. How true is this same analogy with the seasons of life that we journey through? When I find myself elbow-deep in the sink with dishes that never end or at Kroger making a scene because I won’t let my 4 year-old eat a grape that she found on the floor, I tend to be fully aware of the season that I’m currently in. I notice the college student buying yogurt. She’s buying yogurt all by herself without a little person telling her they hate that kind or that they want M&Ms instead. She is in a different season. Or maybe I notice the mom with older children. She can leave her younger kids with the older while she and the husband go on a date. Built-in babysitters. A different season. Then there’s the friend who has this great job making a impact in the community and doing what she loves. Oh how I wish I were there. But that’s not my season. That’s her’s. Just as winter turns to spring, the landscape of our circumstances change. The stark darkness of our night duty with baby transition to sleeping like a baby. Seasons of struggle become the very moments that our hearts will long for. Not because of the things we struggle with, but because of how we can look back and see the good within them. Each one hand-picked by the Creator for us to experience. He will never put us into a place that we are not meant to be. If you’re familiar with this scripture, then you know that it goes into a long list of things that have a specific time. The good and the bad. Like the scenes at Kroger and the potty training victories. The trips to the store to buy yogurt alone and the times when the crew drags along with you. This tells me that even though we have no idea what’s coming up or why we’re here and someone else is there, that God is in control. It’s a part of His grander plan. Let’s embrace the place where God has us. Let’s find the purpose in our season. Right. Now. If we are busy focusing our sights on where we aren’t, how can we truly be present where we are? What is in front of you right now that you might be missing? Sister, nothing brings greater joy than contentment. Seasons are temporary. As fleeting as the wind. 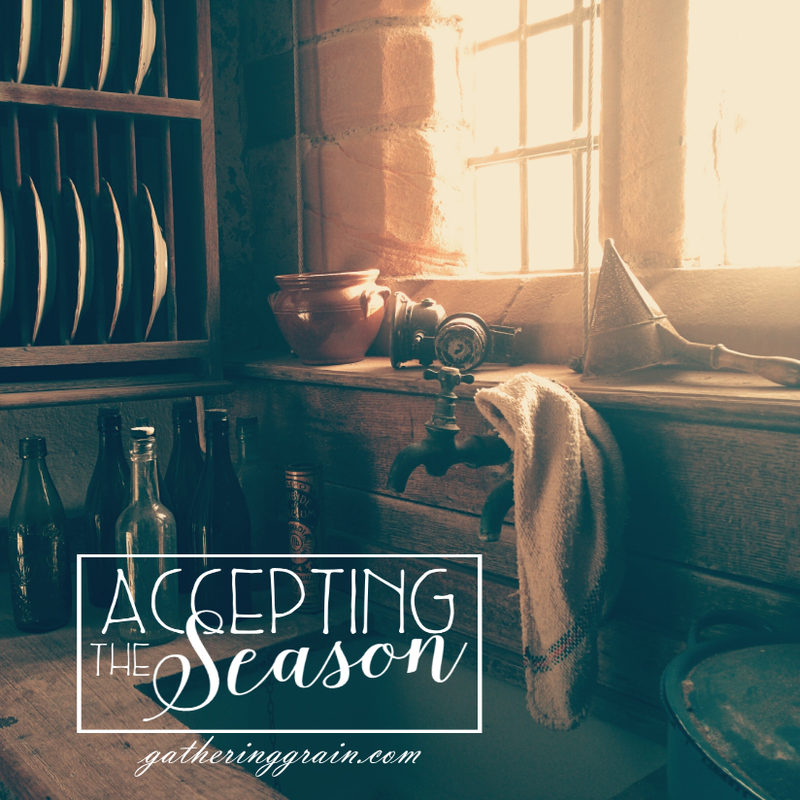 Accept the season. Whatever it may be. Know that Jesus Christ works in the mundane and the messy. He makes all things new and reveals His purpose if you just take joy in the season that you are in. I’m a fantastic listener. It’s a good thing that people like to talk to me. I can sit for hours and let folks unload their verbal baggage on me. That’s an imperative part of being a friend, sibling, spouse, and even parent. People like be heard. It’s a good thing that I like to listen. The problem that I have isn’t with listening. No, my problem is speaking. I’ll admit that it’s an issue of mine mostly around those that I’m closest to. My family. Let me be real honest with you. My husband, bless him, tends to get the brunt of my words. And when you live with someone, your filter can wear a little thin. I won’t lie to you, there are times when I say things to my husband and almost immediately I think why did I have to say that? Perhaps my honesty with him is less filtered because I know he isn’t going anywhere. 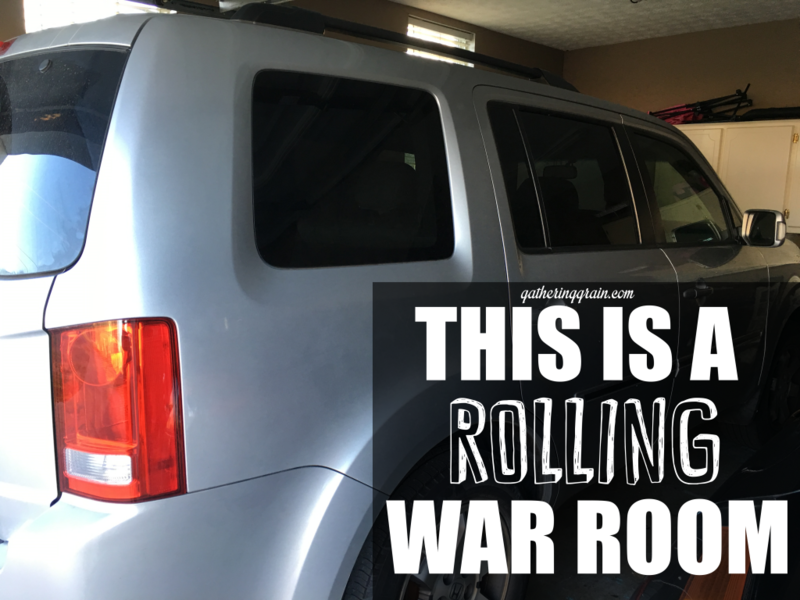 Even still, our spouses deserve the same respect that we show others. God has really been ministering to me about my speaking the last few months. I read an article recently that said that every day we say enough words to write 50-60 pages in a book. In an entire year, we could author 264 books with at least 200 pages. If your books went on sale right now at Barnes and Noble, would you stand behind the words written in them? I would burn some of mine. Words are powerful. What you say and what you don’t say matters. 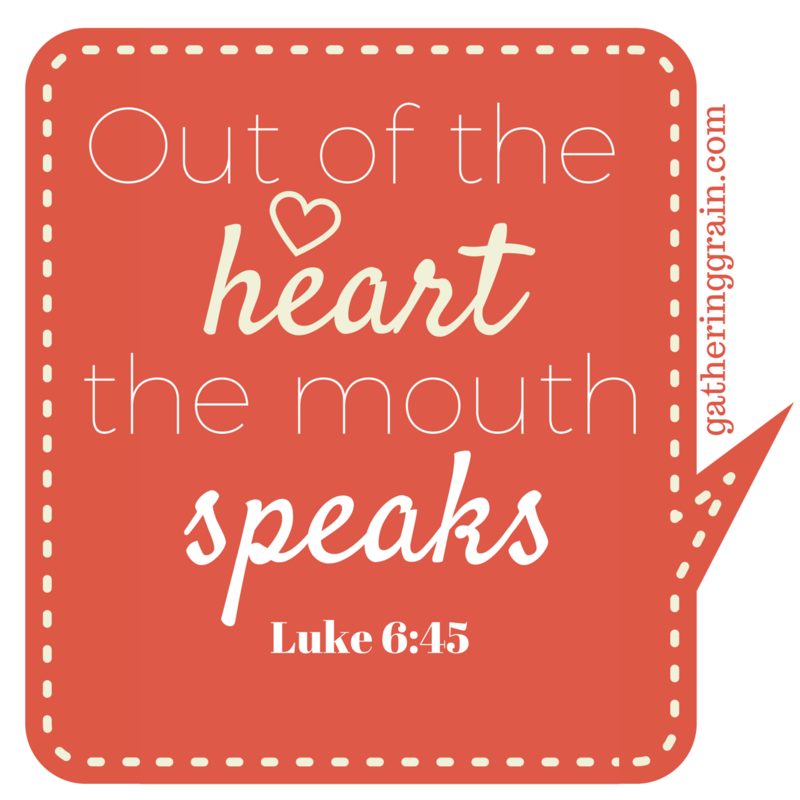 Matthew 6:45 says …for out of the abundance of the heart, the mouth speaks. If within our hearts we only want to build others up, our words will reflect that. If we say unkind things, we may have a heart issue. The point is to fight the urge to let our hearts become hard and say those things that do build others up. It’s not easy every time. Our flesh and inherent sinful nature will always be resistance, but we can choose to hit the override button and say only things in truth. Jesus was all about relationships. Relationships depend heavily on words. Make them good ones. Make them count. Make them uplifting, inspiring, cheerful, heartfelt, motivating, encouraging, truthful words. Lord I pray for the hearts reading this right now. I pray for you to wash over our hearts and to refresh our spirits with truth. Help us to say only what is good for building others up like you have said in Ephesians 4:29. Give us guidance for when we should speak and when we should be silent. For when we should talk and when we should listen. We pray that you would shine through what we say and that it would bring you glory. I told you that God has been working on me and my words? He sent the book Keep It Shut to my door. God isn’t always subtle, is he?! Family Christian sent me this book written by Karen Ehman to review. I gotta say, this one had me reviewing myself more than the book. It challenged me. It really did. 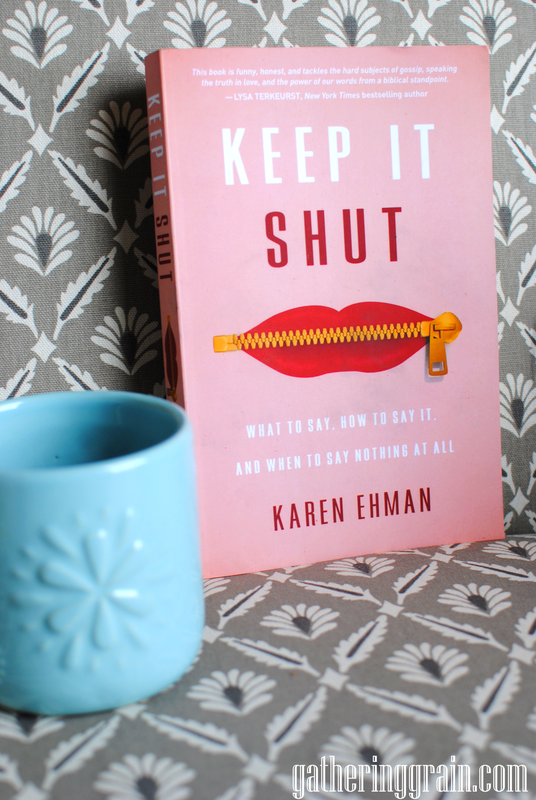 Karen covers pretty much every aspect surrounding the tongue in Keep It Shut: gossip, people-pleasing, truth-telling, social-sharing, manners, motives, lying, listening, and love. It’s all there! She is funny! She uses the Bible as a model for which to go by. And she addresses such common issues that life throws our way and also how to react with our words. It’s divided into chapters that cover all the different things that I’ve talked about. In this book, you will find lots of great tips and many great Bible verses. I recommend this book to anyone who wants to work on their words. You can find Keep It Shut by Karen Ehman at Family Christian….OR you can win it below! This giveaway will end on Monday, February 15th at 11:59pm CT. I will randomly select and winner and I will contact them on Monday the 16th and they will have 24 hours to respond. If I have not heard from them, I will randomly select a new winner. I was provided with Keep It Shut by Family Christian for review purposes. All opinions expressed are 100% my own. I want to begin by saying that I have absolutely no issue with anyone who supports Santa with their children. That is a personal choice for your family and I make no judgement on that. We are all free to make our own traditions and memories with our families. My husband and I both grew up with the Santa thing. We left cookies for Santa, listened for reindeer hooves on the roof, and sent Santa letters. We never got together and said that when we had kids we weren’t going to play the Santa game with them. We knew that we would let the Lord lead and He has. For years our family has done the Santa stuff. We’ve visited him with long lists, made extra special cookies, and even left his reindeer food on the front porch so they would find our house. We sat down together a couple of nights ago to have the talk with our girls. No, not the birds and the bees, but the talk about the fact that Santa isn’t actually real. I was a bit hesitant as we sat there waiting to break the news. I knew that within the next few moments we were going to be saying words that were going to change their lives forever. They would be going from children who had that bewilderment of a man that flies with reindeer to children that knew that was not real. I always thought that we would tell them when they asked us a question first. God had different plans. This was the first and most important reason that we told them. This began to hit me last Christmas. I kept feeling the nudge to ask my oldest what she thought about Santa. She told me one day that someone at school had told her that Santa wasn’t real and that she didn’t believe them because how could we (her parents) get all those presents each year. I didn’t say much and just let her believe what she wanted. We went along pretending as the feeling of conviction (which I didn’t immediately recognize as that) got worse. I shared this with my husband and he wasn’t sure if we should drop this bomb or not. This year as Christmas grew closer, I knew that we had to. I didn’t know how or when, but we had to tell them. If you take a look around, most of the world is spending their time emphasizing Santa. 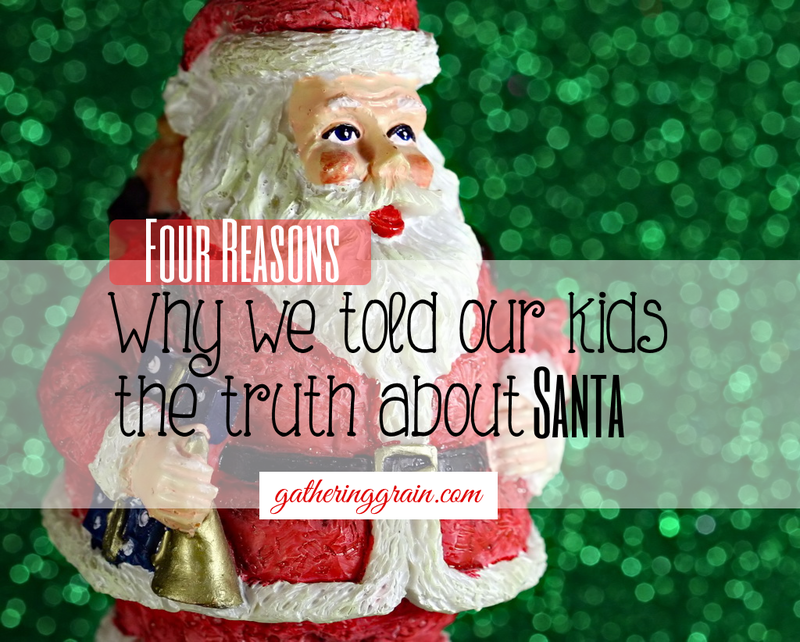 We can’t depend on them to explain the TRUTH about Christmas to our children, that’s our job. So when it comes down to it, we want them to celebrate Christmas because of the birth of Jesus Christ, not because of presents or stockings. Say you’re on the way to the doctor and you know they are about to get a whopping five shots. Your kid asks you if they are getting shots today. You say, “Oh, I’m not sure we’ll see when we get there” and change the subject. You may not have meant to lie to them, but you told a white lie to avoid meltdown. Some can be seemingly harmless like the scenario above, but where do we draw the line? If we continue to tell them little white lies, will they really trust us when we actually tell them the truth? It’s important for our children to be able to trust us. When we convince our children to believe in an imaginary man only to find out later he never existed, what will they think about what we have taught them about Jesus? I felt a little silly with this being a reason, but after much thought it’s not so silly now. There were years when my daughter would ask for things that were just way out of reach for us as her parents. She got a little upset one year when she didn’t get what she wanted. I think she may have thought that because he’s Santa, that he can produce anything even if it costs $300! Telling her this has opened her eyes a bit to see that me and her daddy work hard to provide these presents for her. I believe that it’s giving her a new appreciation for her presents. Not to mention that we don’t have to explain why Santa uses the same wrapping paper as we do! Or why Santa left a Dollar General price tag on that one thing. We began by telling them that Santa was in fact real. He was a true saint back in the 4th century who was a very religious man that dedicated his life to giving to the poor and needy. He knew the real meaning of Christmas about baby Jesus. And because of that he gave just as the wise men did. We told them that even though Santa was a great man from the past, that he wasn’t magical and that he didn’t fly with reindeer. Expecting a flood of tears, the question that followed from my oldest’s mouth was this. She looked at her daddy with a sneaky smile and said, “Dadddddy! So it’s YOU who eats all the cookies on Christmas Eve every time!” She talked about this all night. And that was that. It went better than I expected, but how could I really have doubted it wouldn’t go well? The Lord lead us to this place! We are not removing Santa from our Christmas completely. We talked with them about how he is still fun to imagine and that even though we know that he’s not real, that the thought of him is still fun and there’s nothing wrong with pretending. He now falls in the same category with Mickey Mouse and Elsa from Frozen, which they know are just for fun! What about your family? Does your family do Santa or no? Join the conversation below. It doesn’t seem like it’s time for Halloween just yet. I still can’t believe that summer is over. We are already making Thanksgiving and Christmas plans! Wasn’t that just last month or something? 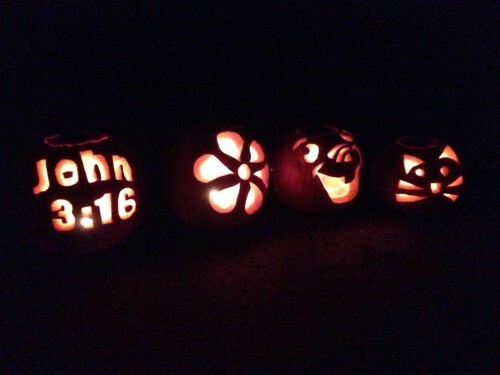 We always have trouble deciding when to carve our pumpkins. The girls are always chompin’ at the bit to get them done, but knowing that they go bad so quickly I like to hold off as long as possible. This year we carved them not too far into October. Just as expected, they began to go bad that same week. But we still have the memories! Here’s a peek into our fun. Each one of us picked out our favorite design. In the beginning I was really ambitious. Picking out intricate things that looked cool. Meet what was supposed to be Olaf. Yeah, not so much. I ran out of room for his eyes so they ended up way far apart. And his nose? Kinda looks like a piece of candy corn on steroids.. But I will say this. He looked much better in the dark! 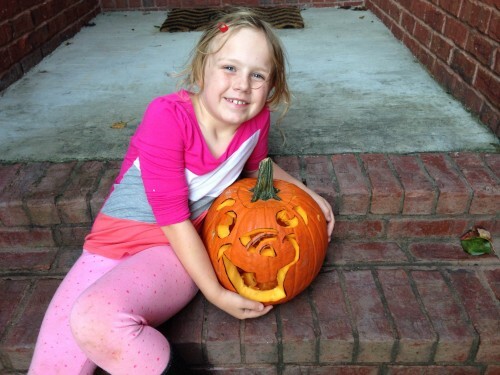 Addie loved her pumpkin anyway! This is Britton’s kitty cat. Was probably the easiest one that I did. And get this, I didn’t even use a pattern. 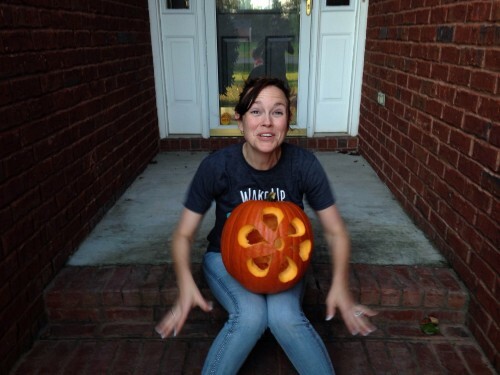 I’m like a pumpkin-carving ninja. 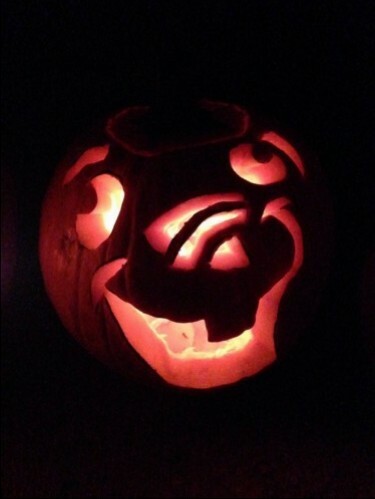 This is my pumpkin. All by hand again. I know, I know. 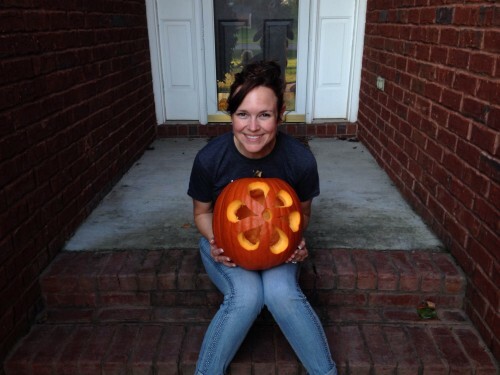 I need to have my own pumpkin-carving reality show. 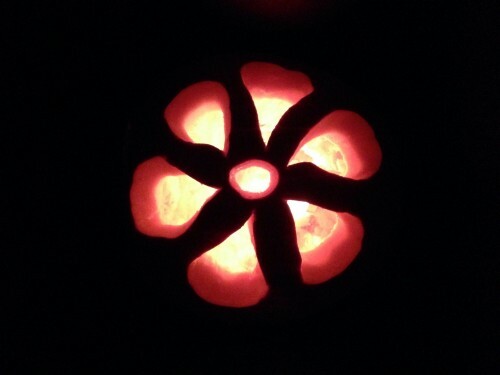 This flower was easy. And just a tad simple, but it was cute! 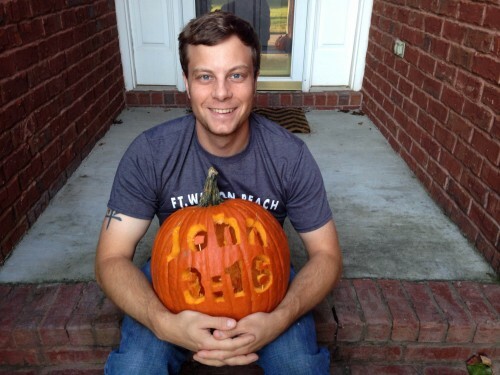 Here’s my pumpkin. 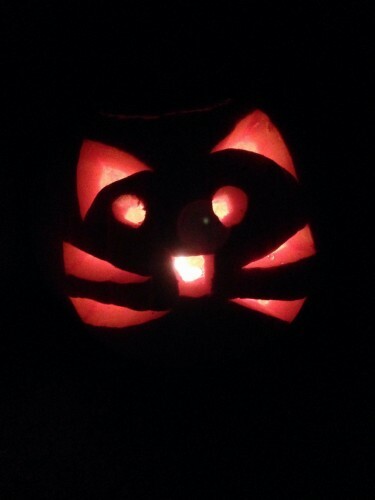 I had just carved 3 of them so I was poooooooped. 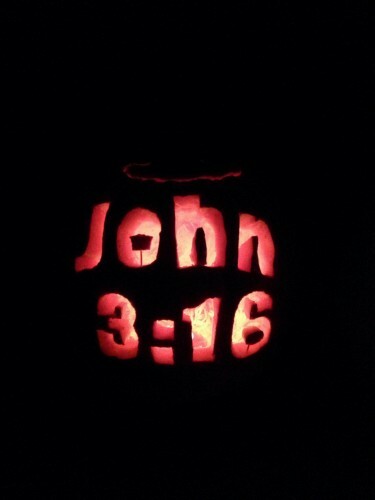 Hubby did a fantastic job on his John 3:16 pumpkin. It was seriously representin’ when lit! He was so proud. He should be! And by the way, he’s such a hottie isn’t he?! I’m throwing this one in there for you. It’s what happens when the hubby takes the pictures. He snaps a billion of them creating a cartoon like strip of photos where you look both stupid and hilarious at the same time. What about you? 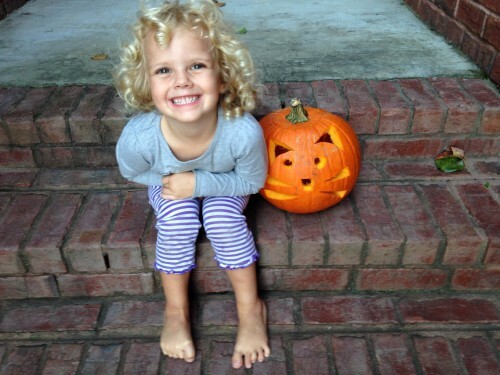 Did you carve pumpkins early on or do you wait? 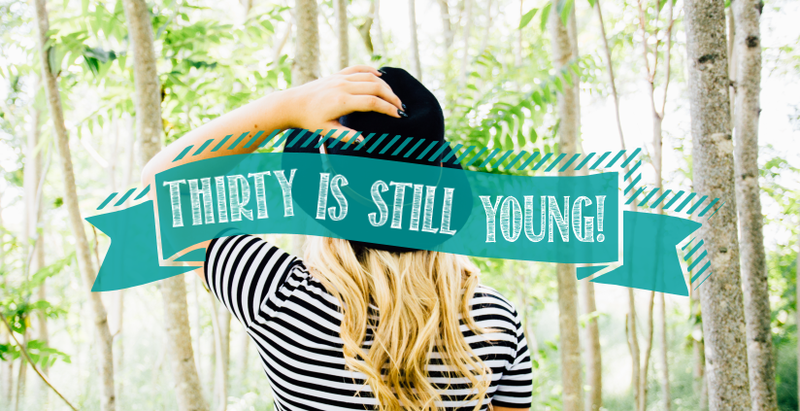 I’m really not that old. However, when I start to think about high school and middle school, I’m reminded of how long ago that really was. I had a lot of fun during those years. I made some of my life-long friends then. That’s even when I met my husband! Some friends would come and some would go, but the true ones always stuck around. I remember our sleepovers, football games, and talking on the phone for hours. A real phone, by the way. We weren’t lucky enough to have cell phones then. Our phones had cords or ranges of 200 feet. It was a good way for our moms to keep tabs on us come to think of it! We definitely couldn’t go very far. I also remember that those years were very hard. There was a lot of pressure to fit in and to be considered “popular” was an achievement. A girl’s identity begins to form around this time. So many changes take place and things seem really intense. Everything is intense. Feelings, thoughts, words. It’s a pivotal time in a girl’s life. When I was 11, my parents got divorced. It was by far, one of the most devastating experiences of my life. It came at the worst possible time for my self-esteem. I felt lost. My dad wasn’t around anymore like I was used to. The world’s influences spoke so loudly. I didn’t go to church anymore. 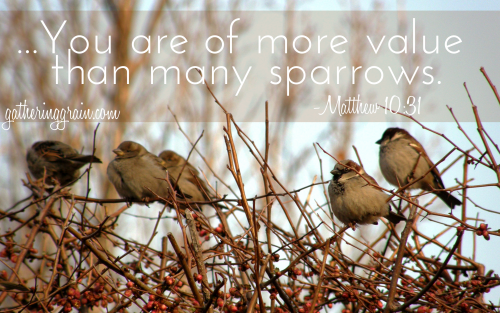 I began to look for my value in the approval of others. I had no idea that the One and only approval necessary had already been granted to me. Young women need so badly to understand their worth. They need to know that beyond the social pressures, expectations, and cliques, that God is doing a marvelous work within their lives. He has a plan and a purpose for every single one. He also sees each one as beautiful. 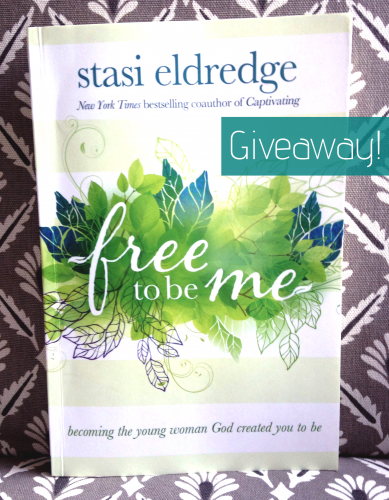 I got the opportunity to read the book Free To Be Me by Stasi Eldredge recently. Can I just tell you that this book is everything I needed to hear when I was letting the world tell me how it is. Stasi does an incredible job of using her past hurts and mistakes to really speak truth into young women’s lives. 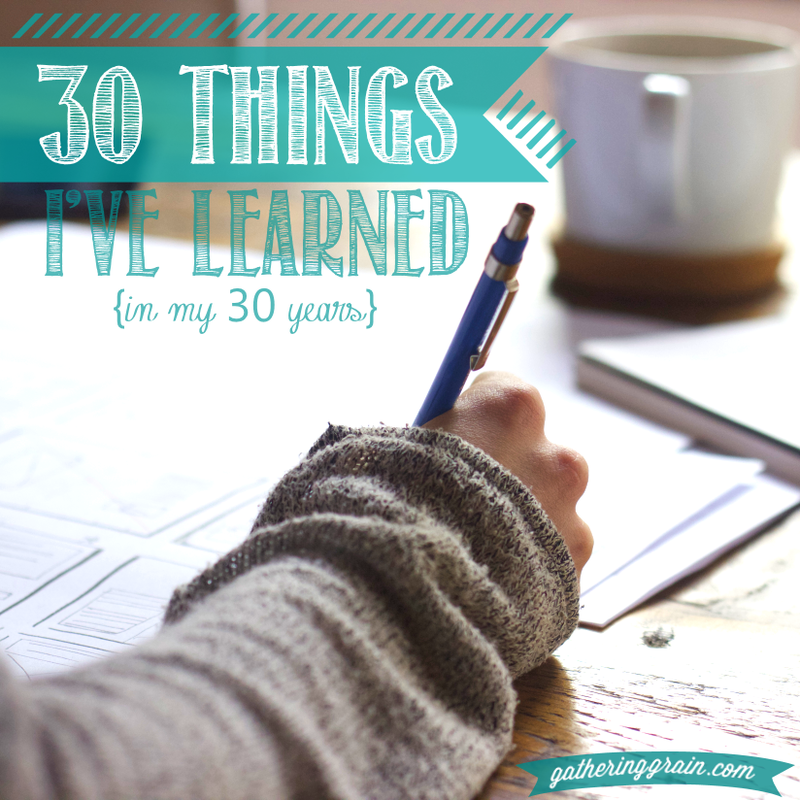 Even as a grown woman, I found lots points that I could use reminders of. This book is for teenagers and would be a perfect gift for a daughter or niece. Any girl that you know really. I will saving this book for both of my daughters to read when it comes time. Such a fantastic resource that I only wish I had when I was that age. I’m giving one away to one of YOU thanks to Family Christian! This giveaway will end on Monday, November 4th at 12:00am CT. The winner will then be chosen at random by Rafflecopter. I will contact the winner on November 4th and they will have 24 hours to respond. If I have not heard from them in 24 hours, I will name a new winner. This giveaway is open to those in the US only. I received a copy of Free To Be Me for the purpose of review by Family Christian. All opinions expressed are 100% my own. The following post is by Gathering Grain on behalf of Family Christian. All opinions expressed are 100% my own. Oh wheeeeeeeere is my hairbrush? Oh wheeeeeeeeere is my hair brush? Oh where oh where oh where oh where oh WHEEEEEEERE…is my hair brush? Where are my Bowling Green, Kentucky VeggieTales fans at?! This may be my favorite VeggieTales song. They are all so cute. It might be a close second to the cheeseburger song. So excited to tell y’all about this awesome event at Family Christian Stores coming up on October 31st in Bowling Green, KY! 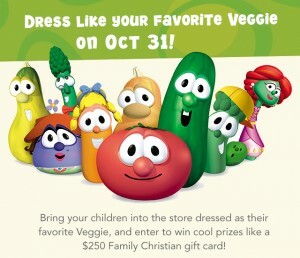 Your child does NOT have to dress like a VeggieTales veggie, just any veggie to qualify. You must have at least ONE child dressed up to enter the contest. And ALL children that stop by during the Dress Like A Veggie Event will receive small goodies! You can find some great costume inspiration on this Pinterest board. There is a COUPON! 40% Off Any Regular Price Item. Print this sucker out and take it with you when you dress like a veggie! Or use it online today! I’m already thinking about Christmas gifts so this would be a great way to save on those. Or just something for yourself. I could spend hours in there. Literally. Coupon can be used at any Family Christian store or online and expires 11/13/14. This event is happening at ALL Family Christian stores nationwide! 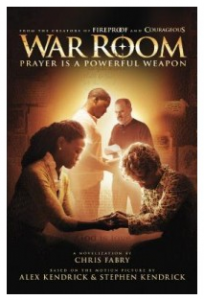 Here’s another Christian movie review coming to you thanks to Family Christian! I’ve talked before about how difficult it can be to find good family movies these days. But I’m so thankful that more and more Christian movies are finally popping up. Not just films with generally good messages and life lessons, either. Films with the message of God’s love are finally hitting the scene. Woohoo! My husband and I got the opportunity to watch the movie The Current. I was a little concerned with the acting in it at first, but once I looked past that I enjoyed it. 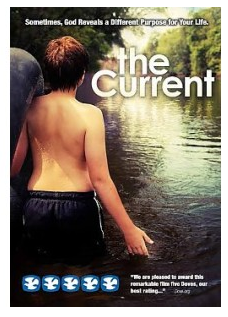 The Current is a sorta coming-of-age story that digs into the big question that so many ask, why do bad things happen to good people? It’s about a boy who moves with his family to live on a campground and meets a friend who forever changes his life. There’s a bunch more to it, but I wouldn’t want to give it away. I found myself both laughing and shedding a tiny tear at this film. And it totally made me want to go camping. Ok, like a teeny tiny bit. Ok, not really much at all. Bugs, ew. My girls are a little young to understand this one, but if they were older I’d have no problems with them watching this. It had a great message! SO, you want to win a copy of this DVD for yourself?! Mandatory Entry: Leave a comment on this post telling me if you’d like to see this movie! Follow Gathering Grain on Facebook. Leave a comment here saying that you did/are. Follow Amy on Instagram. Leave a comment here that you did/are. Follow Amy on Pinterest. Leave a comment here that you did/are. Sign up for Gathering Grain’s Email Newsletter. Leave a comment here that you did/are. 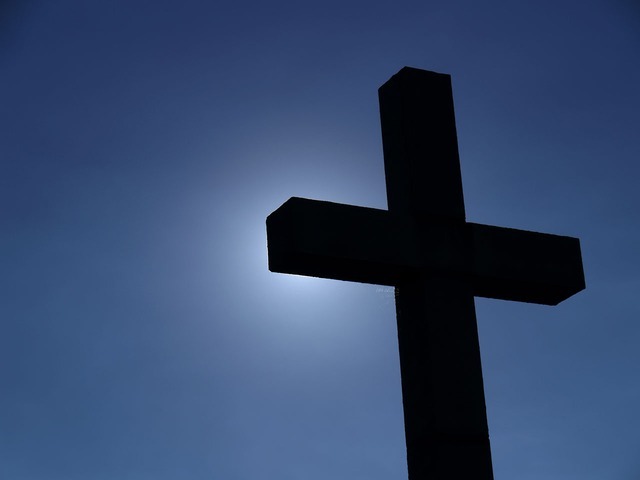 Follow Family Christian on Twitter. Leave a comment here that you did/are. Follow Family Christian on Pinterest. Leave a comment here that you did/are. Follow Family Christian on Facebook. Leave a comment here that you did/are. Follow Family Christian on Tumblr. Leave a comment here that you did/are. Follow Family Christian on Instagram. Leave a comment here that you did/are. TIP: The more comments that you leave here, the more entries that you will receive! This giveaway will end on Tuesday, October 21st at 8:59pm CT. The winner will then be chosen at random by And The Winner Is wordpress plugin. I will contact the winner on October 22nd and they will have 24 hours to respond. If I have not heard from them in 24 hours, I will name a new winner. This giveaway is open to those in the US only. I received a copy of The Current for the purpose of review by Family Christian. All opinions expressed are 100% my own.